Author and wildlife photographer Eric Dresser will present a wildlife photography program and workshop at the Wild Center in Tupper Lake on September 26th. From 11:00 am – 12:00 pm Dresser will offer Wild About the Adirondacks, a program of photos of Adirondack wildlife throughout the seasons. During the presentation, which is being offered in partnership with The Adirondack Photography Institute, Dresser will discuss his photography techniques. The program will run for about an hour and is free for members or with admission. Eric Dresser is an internationally published photographer who specializes in wildlife and landscape photography from the northeastern United States and Canada. His credits include Adirondack Life Magazine, National Wildlife Magazine, The Nature Conservancy, US Forest Service, Canadian Parks and Wilderness Society, L.L. Bean Catalogues and many more. Eric is also an instructor for the Adirondack Photography Institute. His first book “Adirondack Wildlife” will be available in the 2009. With over 35 years of experience in the field, Eric has developed many strategies for getting up close and personal with his wildlife subjects. His love and passion for our natural world can be seen in his photographs. According to a recent announcement, The Wild Center‘s upcoming series of events will help “break down the modern obstacles that keep children from discovering the natural world.” Their Center’s stated goal is to help children across the Adirondacks develop a better understanding and appreciation of the environment in which they live. To those end’s the Natural History Museum of the Adirondacks will will host Take A Child Outside Week events from September 26th through October 2nd. On Saturday, September 26th and Sunday, September 27th, the Wild Center will host naturalists for three family activities each day. Throughout the week, Monday, September 28th through Friday, October 2nd there will be activities for kids and families after school from 3:30PM – 4:30 PM. These programs are most appropriate for ages 7-12 yrs. No registration necessary. All programs are free for members or with paid admission. 11:00 a.m. Discovering Pondlife: Get your feet wet sifting for aquatic invertebrates in Frog Pond. Learn how to ID the smallest pond life and even check out some of the things you find in the pond under a microscope. 1:00 p.m. Sensory Walk: Explore the pond with a Naturalist and learn how you can use your senses to explore the natural world around you. 2:30 p.m. Fly Fishing: Learn to fly fish with Northern New York Trout Unlimited using yarn casting poles in the tent. Then move out onto Greenleaf Pond with the professionals and catch (and release) fish from pond. 11:00 a.m. Pond Life: Explore Greenleaf Pond with a naturalist and see all kinds of pond life. Find frogs and turtles and learn how to ID them. 1:00 p.m. Sensory Walk: Take a walk around the pond with a Naturalist and learn how you can use all your senses to explore the natural world around you. 2:30 p.m. Nature Photography: Bring a Digital Camera or borrow one of the Museum’s and take a walk down the Museum trail to take photographs of the sights you see. Then pick your favorite and print it out to take home. 3:30pm – 4:30pm all week – Kids and families, join us afterschool for a Green Hour of fun outdoor activities including nature photography, sensory walks, getting lost and found, fort building and discovering what lies beneath Greenleaf Pond. No registration required. MONDAY, September 28th: Nature Photography: Grab your digital camera and join a naturalist for and outdoor activity called “Camera” then take a hike down the trail and take photographs of the sights you see. Then pick your favorite and print it out to take home. TUESDAY, September 29th: Nature Play: Take a walk down the trail with a naturalist and play some outdoor activities. Search or hidden objects, use your nose to find similar scents and other activities along the Museum Trail. WEDNESDAY, September 30th: Pondlife Discovery: Walk around the pond and search for pond life, learn how you can ID turtles and frogs, then sift for aquatic invertebrates in Frog Pond. Come prepared to step into the water and maybe get your pants a little dirty. THURSDAY, October 1st: Sensory Walk: Come take a walk with a naturalist and learn about your 5 senses and how different animal uses their senses. FRIDAY, October 2nd: Fort Building: Take an off-trail hike into the Museum property and build shelters with only what nature supplies. A couple years ago I went out with a local biologist to listen for whippoorwills as part of a census that was being conducted in the Adirondacks. We were assigned some back roads around Bolton, and we had to drive them after sunset. Several times we would stop, get out of the vehicle, and listen for the tell-tale “whip-poor-will” call. One of our stops found us surrounded by trees in the middle of nowhere (a real backwoods road). It was dark, and it could’ve been creepy, in that way that only dark, strange woods can be at night. As we stood there listening to the silence, we started to hear a strange sound. It’s hard to describe, but overall it could be likened to a quiet, slow sawing sound – like that of a bowsaw being drawn through wood on short strokes. Fortunately, both of us were prepared, for we both have degrees in forest biology. If we hadn’t, this sound might’ve freaked us out. But thanks to our education and a love of the woods, we were pretty confident that what we heard was the chewing sound of a sawyer beetle. Sawyer beetles are also known as longhorn beetles, and the most common one in the northeastern United States is the whitespotted sawyer (Monochamus scutellatus). This native beetle, recognized by its very long antennae (longer on males than females) and the white spot “between its shoulder blades” (technically at the top of the elytra, or wing covers), makes its living by chewing the bark on the underside of twigs of the balsam fir, assorted spruces, and white pine. This behavior results in flagging: dead twigs, readily noticeable by their reddish color. To some, this damage is merely cosmetic. In fact, many foresters only consider the insect to be a secondary pest, for it often will turn up in trees that are already dead or dying. The adult female looks for ideal sites for egg-laying: crevices in the bark of weak or recently killed (or cut) trees. After hatching, the larvae start chewing their way into the tree. The youngest instars hang out beneath the bark, while the older ones make their way into the wood, tunnelling towards the heart of the tree. As pupation approaches, the larva turns a 180 and heads back towards the surface. The opening to the world beyond is blocked up with a plug made of wood chips, behind which the larvae pupates. As an adult it emerges from its woody tomb and goes in search of a mate, the cycle beginning once again. If you want to avoid sawyer beetles on your property, you need to manage the dead and dying timber. Additionally, if you have cut logs lying around, remove the bark and set them in the sun. This will make them less appealing to females looking for egg-laying sites. 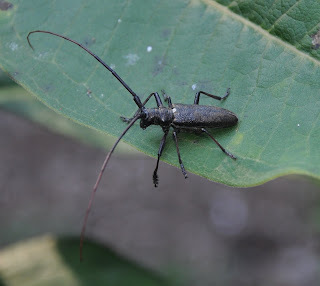 The whitespotted sawyer should not be confused with the Asian longhorned beetle (Anoplophora glabripennis), an invasive that is making its way northward, leaving a trail of dead trees in its wake. So far, this beetle has not gotten into the Adirondacks, but that could be only a matter of time. If you find longhorned beetles around your property, learn to identify them; there are only a handful of species in our area and being able to ID them could help save our forests from unwelcome invaders. By the way, we never did hear any whippoorwills. “You have to get your camera and get a picture of this really cool bug!” exclaimed my coworker breathlessly. So I grabbed the camera and went outside. The insect in question, as soon as I had it in my sights, promptly took off and vanished. After much skulking around, I was finally able to capture its image. 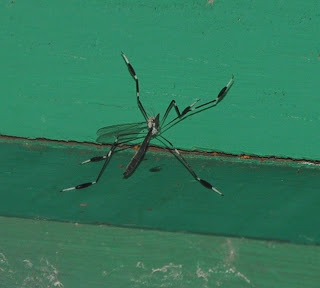 “I think it’s some kind of cranefly,” I said, based on the long skinny legs and the overall body shape. But, not being an entomologist, I wasn’t about to stake my reputation on it, so I sent the image off to BugGuide.net for confirmation. Gosh, I love it when I’m right. It turns out this beautiful insect is a Phantom Cranefly (Bittacomorpha clavipes). It gets its name from its cryptic coloration. I know what you’re thinking: black and white is hardly cryptic. Why, the insect stands out like a sore thumb. AH, but when the insect flies into the shade, the body seems to vanish, phantom-like, with only the white bars remaining visible. This explains why I had so much difficulty tracking it every time it took off. It turns out, however, that this delicate insect has an even more interesting bit of physiology than its coloration. The part of the legs that we might liken to ankles is specially modified. Up close, these sections are swollen and concave in shape. When the insect flies, it spreads its legs out and the wind catches the “ankles”, pushing the insect along like a little kite. The Phantom Cranefly begins its life when the female lays her eggs, singly or in small clusters, along the edge of water. Soon the larvae emerge and begin a life of scavenging organic matter in the shallow water. The strange larva is easy to recognize by its “tail,” which is, in fact, the larva’s breathing tube. Just like a snorkle, this apparatus is lifted to the water’s surface, emerges long enough for the insect to inhale, and then down it goes again to continue scavenging. When the larva is ready to pupate, it crawls out of the water and digs into moist soil. There, beneath the ground, it goes through The Change and becomes an adult. The adults exist for one purpose only: to breed and pass on their genes. As such, they do not eat (or if they do, it is very little and no scientist has discovered what it is). It’s really a rather uneventful life, so perhaps the boredom is broken up by the flashy colors and nifty body ornamentation. At the very least, these insects are attractive to insect enthusiasts and non-enthusiasts alike. So keep your eyes peeled, and if you see a small wispy black and white kite drift by, take another look. It might just be the Phantom of the Adirondacks. Recently a woman dropped off an injured robin at our front desk for the local wildlife rehabilitator to pick up. It was in a roomy box and I simply set it aside until the rehabber came, knowing the animal was already under stress and didn’t need me peeking in at it. A couple days ago I asked the rehabber how the bird was doing. I expressed my condolences, but instead of wanting sympathy, she exclaimed “People shouldn’t let their cats outside! We need to tell them this!” So here I am, passing the word along. Cats are natural predators, and birds, as well as mice, squirrels, snakes, baby rabbits, and insects, are on the menu. We may not think about it much if Fluffy brings home a sparrow once a year, and if it was only that, it might not seem so bad. But, coincidentally, Audubon Magazine just came out with an article by Ted Williams about this very topic and the statistics are staggering! In one study in rural Wisconsin it was determined that there are at least 1.4 million cats running loose in the wilds of that state, and on average they are each eating about six birds a year. If you do the math, that comes out to almost eight million birds! And chances are they aren’t starlings or English sparrows, invasives we could well do without. No, these are often warblers, hummingbirds, tanagers…neotropical birds that spend the summers breeding in the north. Birds whose futures are already on shakey ground thanks to habitat loss. Birds whose populations may already hang in the balance. Much of the article focused on the Hawaiian Islands, where feral cats (and the introduced mongoose) are wreaking havoc on the native birds, many of which are endangered species. Well, we say, the solution is easy: trap out the cats. And it would seem easy, except cats have a huge and powerful lobby. Cats? A lobby? Yes – believe it or not, feral cat advocacy groups have sprouted up all over the US (and its territories). Their philosophy is to trap the cats, spay or neuter them, and then release them back into the wild. In theory, they will not be able to reproduce and over time the colonies will disappear. In reality, you’d have to trap and fix 70-90% of the cats in any wild population to even make a dent in the population (and that doesn’t factor in other feral cats, or newly dumped pets, joining the existing colony). Cats are difficult to trap, so in reality, that percentage is rarely reached. But let’s say 90% get fixed and are all turned loose again. Those cats may not be able to breed, but they can still hunt, and that is the problem. So the advocacy groups put out kibble. Fluffy will be fed, then, and won’t be hungry. Well, if you have a cat, you know that Fluffy doesn’t necessarily hunt for food. Fluffy hunts for the thrill of the stalk, the joy of the capture, the pleasure of playing with the prey. While reading the article, I was horrified to learn that the cats’ lobby is so strong that Fluffy and his friends have more protection than endangered species! It’s hard to believe. Nationwide, millions and millions of birds lose their lives to cats. Many of these cats are feral, but many are also pets, pets that are let outside so they can “do what cats are supposed to do.” In rural areas, the numbers are high, for farmers like their barn cats, and we rural folks like to believe that cats should be able to hunt. But the truth is that the wildlife cannot support Fluffy’s habits. Not only are the birds suffering, but in some places Fluffy has reduced the wild prey to such levels that the natural predators don’t have enough to eat. And then there’s the spread of disease, things like toxoplasmosis, which can be deadly. 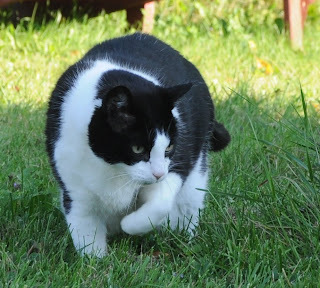 When I walk around my neighborhood, I often see my neighbors’ cats out for a stroll or a hunt. And recently I’ve seen young cats, no doubt feral, that are lurking around bird feeders and garages, looking for small mammals and birds. And I admit, I let my own cat out occasionally in the summer, but my yard is fenced and he’s too old, fat and lazy to chase a bird. Or so I tell myself. The upshot of this story is a plea to folks to think twice about letting Fluffy outside to hunt. Most domestic cats are content to live the life of Riley indoors, where food and comfort are in plentiful supply. If you feel Fluffy needs to hunt, there are plenty of cat toys out there that you can supply, and this will also give you the opportunity to spend quality time with your cat. 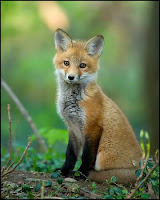 And if you know of a feral cat, or a feral cat colony, consider the impact it is having on the wildlife. Instead of maintaining it, look into capturing the offeder(s) and getting it/them into an animal shelter. Remember, there are plenty of cats in the world; it’s the wildlife that is in decline. ‘Tis the season for White Snakeroot (Ageratina altissima). This pretty, weedy plant can be found blooming in many of our forests from late summer “until frost.” Hm…that could be any day now, if you believe the weather reports! One of the nice things about white snakeroot is that it is one of our native plants. According to my field guide, it is classified with the bonesets and Joe Pye weed – a Eupatorium. However, botanists, like birders, can be found reclassifying living organisms on an almost daily basis, it seems, and now this plant is in a separate genus: Ageratina. I think that because we are surrounded these days with warnings about non-native invasive species, we tend to slip into the idea that native plants must all be good. In one sense they are: they are good for the ecological niche in which they have evolved. But this doesn’t make them “good” plants, necessarily. White snakeroot is an excellent example of this, for it is poisonous. Back in the 19th century, many many people died from a disease that was labelled “milk sickness.” It seems that some milk (and, it turns out, meat) was tainted with something that made the cattle ill and killed people. The disease was known to wipe out large portions of early settlements (Abraham Lincoln’s own mother was one of its victims), and it became such a problem in parts of Kentucky that a $600 award was offered in the early 1800s to anyone who could find the cause of the disease. Although not officially identified until 1928, legend has it that Dr. Anna Bixby (1809-1869) identified the causative agent long before that. Supposedly many of her patients were dying from milk sickness, and, as was probably fairly common at the time, the disease was blamed on witchcraft. Dr. Bixby knew there must be a more rational explanation, and noted that the disease only turned up in late summer and into the fall, and it seemed to be based on something the cattle were eating. One day she met up with a Shawnee woman who told her that white snakeroot was the culprit. Dr. Bixby fed a bit of the plant to a calf, which promptly displayed all the symptoms. She had all of the plant torn out from the fields and forests where cattle were grazing, and remarkably, the disease went away. Sadly, she never got credit for this (nor did the Shawnee woman). What happens is that cattle eat white snakeroot when there is no other forage around, so it’s not like it’s a primary food choice for them. The plant contains tremetol, which is the poisonous compound. Tremetol is stored in the meat and milk, and thus it gets passed on to people who consume these cattle products. , the Cherokee and Iroquois did use this plant for a variety of medicines, including treatment for urinary ailments, as a diuretic, and as a treatment for venereal diseases. He doesn’t say, however, how well the medicines worked. Still, just because a plant is toxic doesn’t mean we can’t enjoy it – just don’t eat it! As you walk through the woods, perhaps along a shady path, keep your eyes open for a scraggly-looking plant about three to five feet tall. The leaves are jagged, and the top has a flattened cluster of white flowers. If you are lucky, you may find some butterflies nectaring on it, for it is one of their foods. Take the time to get to know it, for it is a lovely plant. Then note where it is so you can be sure your cattle don’t graze upon it. Invasive species are everywhere: birds, bugs, fish, flowers, fungi. It seems that every time you turn around, a new invasive species has sprung up, each with its own inherent threat on the local ecosystem. What we don’t hear about, however, is often the solutions that are applied to address the problem. 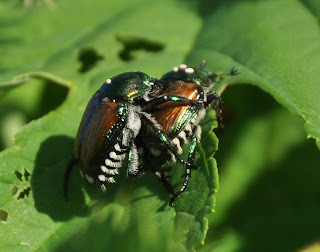 Take for example the Japanese beetles in this photograph. What do you notice about them that is unusual? The white dots on their thoraxes. I pondered these, wondering if they were parasite eggs, warts or merely beauty marks. The number of dots differs on individual beetles, and some have none at all. Because of this variation, and the fact I had never seen them before, I was leaning towards parasites. » Continue Reading.
? Certainly not I! Not only is the title attention-getting, but the book is a bilious acid green, the perfect color for poisonings! I first heard about this book on the radio, and after about a month of waiting, I was able to borrow a copy from the library. After reading it, I had to get a copy for myself; no self-respecting naturalist’s arsenal of natural history reference books would be complete without it! This tiny tome is chocked full of interesting information about some of nature’s most dangerous plants, many of which surprised me. For example, these days the news is smattered with dire warnings about giant hogweed and wild parsnip (members of the carrot family, yet capable of causing painful blisters and phototoxicity to those who brush up against them), but who knew that cashews could be problematic if not prepared correctly? Yes, cashews are related to poison ivy, poison sumac and poison oak. If eaten raw, or if they are contaminated with bits of the nut shells, the person consuming them can break out in a serious rash, which could be exacerbated if one is strongly allergic to urushiol, the irritating oil. While many of the plants mentioned in this book by Amy Stewart come from lands far from the Adirondacks, there are a fair number that can be found within the Blue Line. Take, for example, elderberry. I remember collecting elderberry blossoms for my grandfather down along the railroad tracks that follow the Mohawk River. He used to make wine from the lacy white flowers. Well, it turns out that most of the plant’s parts (leaves, roots, stems, etc.) contain cyanide. This is especially true of the raw fruits. Cooked, the fruits are rendered more or less harmless, but when consumed raw they could send one to the hospital in a great deal of pain and discomfort. How about cardinal flower? This brilliantly scarlet member of the genus Lobelia is found fairly commonly along waterways within the Park. As lovely as it is, the red color should be a warning. It contains poisons that are similar to nicotine, and if one were to eat it (although I don’t know why one would), one would likely suffer from tremors, nausea and vomiting, paralysis, and heart problems. Not only does Ms. Stewart point out plants that are deadly, she includes those that are destructive (like purple loosestrife and kudzu), those that are offensive to the nose (purple trillium and skunk cabbage, among others), and those that actively cause problems (killer algae and gas plant). I was so surprised at some of the nastiness that Mother Nature has in store for us that I was hesitant to burn the invasive honeysuckles we cut down last year. What if this aggressive non-native plant harbored some sort of chemical that was dangerous when set on fire? Nonetheless, burn it we did (the cut logs had started to sprout and had to be destroyed), and I can report that although I got a snoot full of smoke on several occasions, I have not suffered any ill effects. Whether you are a plant aficionado, or a nature enthusiast in general, you will not want to pass up this delightful little book. I really love macro photography. You need a good lens, you need a good tripod, and you need to be willing to get dirty and wet. But when you get right down to it, you discover some of the most interesting things. Anyone can take a photo of a landscape, or of Billy with jam on his face. But it takes a special kind of person to get up-close photographs of Mother Nature. This person needs patience and a whole lot of determination. What I love most about close-up shots of tiny things is that it opens up a whole new world. Take this photo, for example. 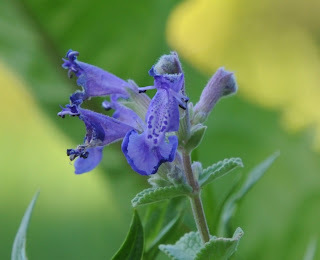 It’s a catmint flower from my garden. Catmint has pale green leaves and a bright aromatic scent. The flowers are small and purple. But until I took this photo and enlarged it on the computer, I had no idea just how beautiful the flowers are. Why, it practically looks like an orchid! Now that I have a camera available 24/7, I find myself lurking in the gardens, stalking roadside ditches, crawling along the forest floor on my belly – all in search of tiny things to photograph. Macrophotography can also make identification easier, at least with things like insects. Insects rarely hold still for very long, making field ID difficult. A close-up photograph and enlargement capabilities can tip the scales in the naturalist’s favor. And it’s a nice alternative to the old naturalist’s standby: capture and preserve for later ID. True, there are times when having the specimen on hand is important, but for most of us, a photograph is all we need. Spiders are another great subject for the close-up photographer. I find that most spiders up close are really rather beautiful. Okay, maybe most of you don’t feel this way, but you’ve got to admit that up close they are, at the very least, interesting. And photographs don’t bite, or sting, or jump! Every naturalist needs a field kit, and in amongst the field guides and rulers, hand lenses and note paper, it should include a camera with close-up capabilities. Get yourself one of these and you won’t regret it (once you learn how to use it). Have you ever walked through the woods and thought something was watching you? You turn around, scanning the forest for eyes, and there they are! 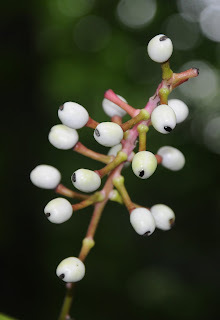 Short red stalks at the top of a green stem, each tipped with a white eyeball dotted with a small black pupil! Is it an alien from outer space? No, but you have discovered the fruit of White Baneberry (Actaea pachypoda), also known as Doll’s Eyes (and White Cohosh). A member of the buttercup family, white baneberry is closely related to the genus Aconite, which includes wolfsbane and monkshood among its species. These are very toxic plants, and likewise so is white baneberry. In fact, if you think about it, the very name baneberry indicates that you should not eat it: bane = murderer, poison, death, woe, a source of harm or ruin. Kind of makes you think twice, eh? The whole plant is toxic (although the berries are considered the most poisonous), laced with cardiogenic toxins that are described as having a sedative effect on the heart muscles. If one decides to snack on it, one can expect to suffer cardiac arrest and death. Birds, on the other hand, can eat this fruit with impunity, and a good thing, too, for they are the primary distributors of its seeds. And thanks to their efforts, this plant is fairly common throughout the eastern United States. You can find it growing in areas with moist, rich soil, favoring north-facing slopes and ravines. Earlier in the season it sports puffy white flowers that are fragrant and attractive, but come early fall, the plant disappears from sight and goes dormant until the following spring. It almost seems too early, but there they were, web and all, clinging to my Royalty Crabapple: fall webworms (Hyphantria cunea). For most folks, the sight of a webby mass clinging to the branches of a deciduous tree brings on thoughts of tent caterpillars. I learned early on in my youth that if you see this mass in the spring, it is tent caterpillars, but if it is late summer or fall, you are looking at fall webworm, an entirely different insect. If you’re still not sure, you can verify which insect it is be monitoring the movements of the caterpillars. Fall webworms stay within their webby nest all the time, eating and sleeping there. They do not leave until they are ready to pupate. Tent caterpillars, on the other hand, only use their webby nest for shelter at night and during inclement weather. When they get hungry, they must leave the nest to forage on nearby leaves. » Continue Reading. (Lost Pond Press, softcover, 240 pages, $20.95) is the kind of book that you will want to have on your shelf – even if you’re not that into birds. Peterson (of Elizabethtown) and Lee (who hails from Inlet), are two of the Adirondack region’s most skilled birders. They drew on decades of experience in selecting the sites for this, the first comprehensive guidebook to birding hot spots in the Adirondacks. Experienced birders can use the book to search for the Park’s most-coveted species, including boreal birds not found in the state outside the Adirondacks as well as uncommon winter visitors and rare migrants. What I find amazing about this book however, is that it offers the non-birder like me an opportunity to find natural places were I can see a lot of great birds – even if I don’t yet know what they are. If an afternoon exploration to a spot likely to be teeming with birds is what you’re after more than working to complete your birding checklist – this is a great book for you. That’s not to say the experienced birder won’t have something to learn here as well. » Continue Reading. Last month I was asked why we aren’t seeing any monarch butterflies this year. I had no answer. Well, I had an answer, but it wasn’t the answer this person was likely seeking. I looked back through my records of when monarchs are first seen each year, and discovered that when I first started keeping track, we didn’t really see monarchs until mid- to late summer; in other words, mid-July and August. Two years ago I saw my first one at the end of May. 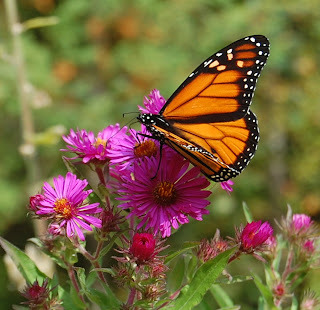 This year, however, July came and went with only a couple monarch sightings. Now August is chugging along towards the halfway mark, and I can still probably count on one hand the number of monarchs I’ve seen. Milkweed plants are conspicuously unmunched, as are the butterfly weeds all around my gardens. » Continue Reading. Ed Miller, an enthusiastic naturalist from Rexford, likes to say he has a special fondness for late bloomers, being a bit of one himself. After retiring from work as an engineer at GE, he threw himself into another life, of paddling, botanizing and exploring. Not many people have seen it, but early August is when the rare Prenanthes bootii (alpine rattlesnakeroot) blooms on a few high Adirondack summits. Mid-August is the time to look on mountaintops for flowering mountain sandwort, three-toothed cinquefoil, closed (or maybe narrow-leaved) gentian and sheep laurel; those species that also grow at lower elevations bloom later on the cold summits. Hall of Fame pitcher Christy Mathewson noted these flowers around Saranac Lake August 5-12, 1922: Rattlesnake plantain, white avens, agrimony, purslane, ladies thumb, common mallow, climbing false buckwheat, husk tomato, chamomile, Oswego tea, large purple-fringed orchis, hog peanut, climbing bittersweet, waxwork, tall coneflower, mayapple, boneset, peppermint, burdock, teasel, bergamot, cardinal flower, fringed loosestrife, sow thistle, milkwort, thimble weed, Indian tobacco, butterfly weed, English plantain. The history and culture of rocks in the Adirondack Mountains will be celebrated on Saturday, August 15 during the second annual geology festival, Rock Fest 2009, from 10am to 4pm at the Adirondack Park Agency Visitor Interpretive Center (VIC) in Newcomb. The VIC staff has teamed up with the Adirondack Museum and SUNY College of Environmental Science & Forestry’s Adirondack Ecological Center to present lectures, field trips, exhibits, and children’s activities. Free and open to the public, Rock Fest was designed to be a day-long exploration to increase appreciation and understanding of regional geology. Exhibits and lectures at Rock Fest will focus on the geological history of the Adirondack Mountains and man’s relationship with natural resources of the Adirondack Park. Mining history will be presented by Adirondack Museum educators. Exhibitors (10am to 2pm) will include: The Adirondack Park Institute, the Adirondack Museum (making sandpaper with kids), Natural Stone Bridge and Caves, High Falls Gorge, the New York State Department of Environmental Conservation, and New York State Geological Survey. The Newcomb VIC is located 12 miles east of Long Lake on Route 28N. For more information about the VICs, log on to the centers’ Web site at www.adkvic.org.